By far the best quality range of anti downdraught chimney cowls available on the market today. Over 4 million Colt Chimney Cowls have been sold since 1931 when the original Colt Cowl was introduced, and Colt Cowls are a chimney cowl brand that is recognised widely as being a mark of quality. Only where you see the Colt Chimney Cowls quality mark below appearing as a hologram on our chimney cowls can you be sure that you are getting Colt quality. Colt Cowls are very proud of the quality chimney cowls we produce and the success of Colt Cowls and its market dominance in the production of chimney cowls since 1931 is testament to that. Colt Cowls manufacture 3 different types of static anti-downdraught chimney cowls, these include Colt Top Chimney Cowls, Colt Top 2 Chimney Cowls and the original Colt Cowls. The purpose of an anti-down draught chimney cowl is to eliminate downdraught. All the models offered use aerodynamic principles to create lift at the top of the chimney as air moves over it. This effect cures downdraught and shifts residual fumes. In other words, by putting one of Colt Cowls anti-downdraught cowls on your chimney, you will stop having a smokey fireplace or stove! All these anti down draught chimney cowl options come complete with fixings to attach to the chimney pot. The newest anti downdraught chimney cowl in the range is the entirely stainless steel anti downdraught chimney cowl the Econocowl. This low cost anti downdraught chimney cowl is designed for the end user or installer working to a budget. It is rare to find a quality chimney cowl available for such a low price. However with the now huge market for stoves burning all sorts of smokeless solid fuels Colt Chimney Cowls wanted to ensure there was a popular chimney cowl available to in the market at a low price while being made of high quality material. The stainless steel structure of the Econocowl means it is one of the most durable chimney cowls available today. 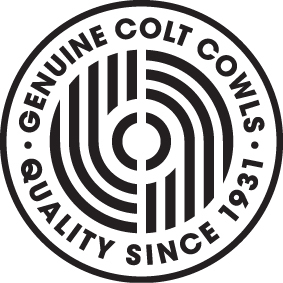 Another mark of quality associated with Colt Cowls is the Colt Cowls Money Back Guarantee. On all 3 of the above models, Colt Tops, Colt Top 2's and Colt Cowls there is an unconditional Money Back Guarantee. Experience has shown that only in isolated cases will our product range fail to solve the problem encountered. 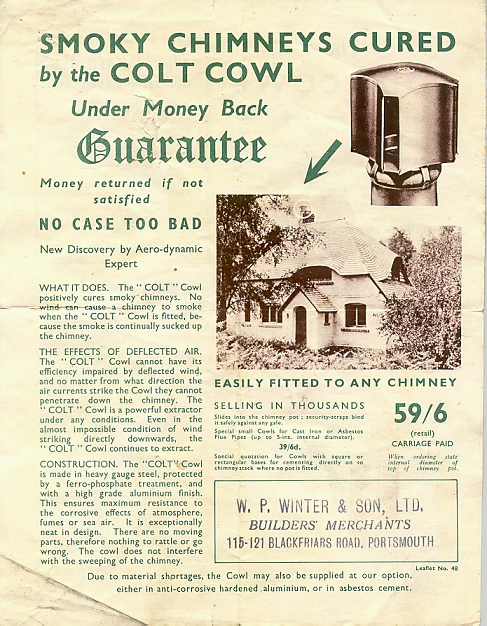 If, having installed the product correctly, the downdraught problem still remains, simply return it to the place of purchase (whether bought directly from Colt Cowls, or through any of our distributors, or builders merchants) within a reasonable period, with full proof of purchase, for a full refund...in other words with Colt Cowls you cannot really lose!